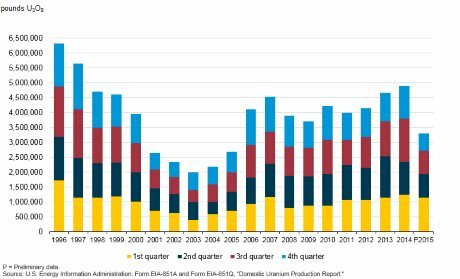 US uranium production in the fourth quarter of 2015 was at its lowest level since 2002 and total 2015 production was the lowest since 2005, according to figures released by the US Energy Information Administration (EIA). Production of uranium concentrate in the fourth quarter of the year, at 585,048 pounds U3O8 (225 tU), was down 24% from the third quarter and down 46% from the fourth quarter of 2014. The quarterly production figure was the lowest since the fourth quarter of 2002. The EIA said that the 49% fall in production from the first quarter of 2015 - when over 1.15 million pounds U3O8 (442 tU) was produced - to the fourth quarter "may be attributed to the low market price of uranium". All of the fourth quarter's production came from four in-situ leach operations: Crow Butte (Cameco) in Nebraska, and Lost Creek (Ur-Energy), Nichols Ranch (Energy Fuels) and Smith Ranch-Highland (Cameco), all in Wyoming. This was three fewer facilities than had produced uranium in the third quarter: Energy Fuels' White Mesa conventional uranium mill in Utah, Uranium Energy Corp's Hobson and La Palangana joint project in Texas, and Uranium One's Willow Creek project in Wyoming did not produce in the fourth quarter of the year. Strata Energy's Ross processing plant in Wyoming, under construction since 2014, became operational but did not produce during the fourth quarter. The EIA's preliminary figure for total 2015 production of 3,303,977 pounds U3O8 (1271 tU) is 32% lower than 2014's production of 4,891,332 million pounds U3O8 (1881 tU) and the lowest US annual production since 2005. According to the EIA, 2015's production represents 7% of the anticipated uranium market requirements of the USA's nuclear power reactors for the year. The EIA's annual report of domestic uranium production is due to be published in May.